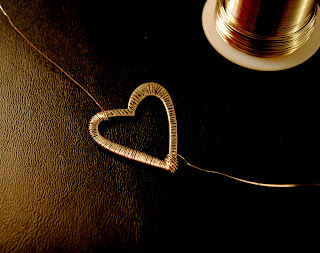 This has been, by far, my most amazing Custom jewelry story to date. 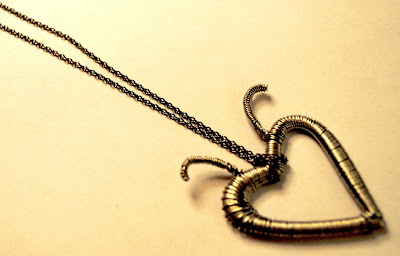 A few months ago I made what I called an "& LOVE" brass necklace. I loved them so much that I kept one for myself (a rarity, I usually like to share my jewelry as much as possible!) and put the other on Etsy. 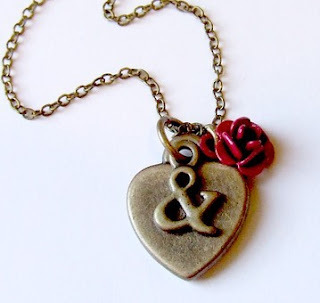 It quickly sold to a guy named Rob, who said he was buying it for his girlfriend because "she absolutely loves anything and everything, so I searched for 'ampersand jewelry' and this item came up. It's really a beautiful piece and I know my girlfriend will love it!" A few weeks later Rob wrote back saying: "My girlfriend absolutely loved her & Love necklace for her birthday. It was her favorite of the five thoughtful presents I got her so that says a lot :) On a separate note, I was wondering if you happen to take requests. 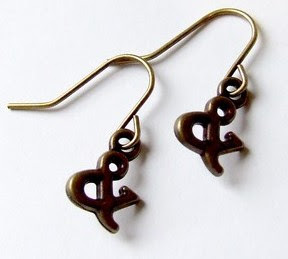 I was wondering if you would be able to make some earrings using the same ampersand charm or something similar. Your work is so good that it left me wanting more!" Thankfully I had a few ampersand charms left, and was able to send him these matching earrings in time for Christmas.Rob wrote that his girlfriend "LOVED the earrings. They look absolutely amazing on her. She's been wearing them a lot during the holidays for big get togethers with her family!" 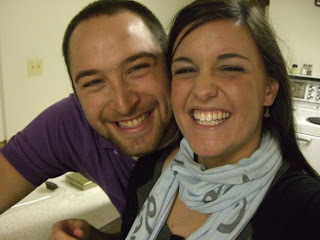 He even included this sweet picture of himself and Hannah wearing the new earrings :) But wait, it gets better! Rob is quite the romantic. Right after the New Year he wrote the following: "Well, I'm already looking ahead to Valentine's Day, and I have another request. Here goes... When we're in public and want to tell each other we love one another without being all mushy and saying it all the time, we put our index fingers at the top of our heads and wiggle them. It's our cute little thing. 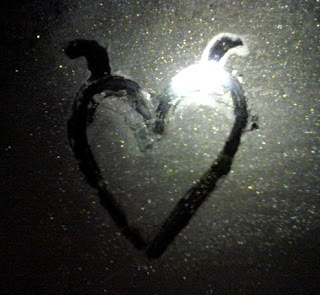 Well, once, she drew a heart in the frost of my car window and added little antennas to it, matching our little "I love you" motion. Now, that's sort of our mark that we draw on letters, fogged mirrors, etc., so I was hoping to have a piece of jewelry that had our "love logo" on it... My thoughts were that I would love a necklace with this on it. Because you are the creative genius though, I would leave it up to you to decide what piece of jewelry would be best and what style would be best. The only thing I require is that our love logo is the focal part of the piece." Rob included the above picture of the heart with antenna ears that his girlfriend drew on a fogged up car window. Isn't that super cute? I told Rob he better start giving tips - he sure knows the way to a woman's heart! I was totally thrilled about the project, and immediately started thinking of ways to incorporate the "logo" in a necklace design. I went to Michael's and, to my amazement, the actually had what I was looking for! 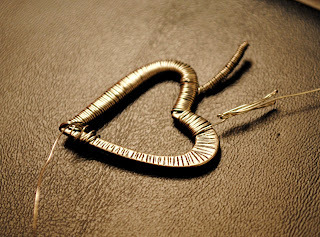 After a few more e-mails back and forth to Rob telling him what I planned to do, I got to work with some 26 gauge wire and and a solitary heart charm.My method was to wrap the heart from the bottom and sides up: And then make an antenna by poking some wire up, then up and down a few times in order to make a thick antenna, then I wire wrapped it like I wrapped the rest, and then continued down the rest of the heart clock-wise: Of course it took half a dozen tries and two episodes of 24 to finally get the thing to look similar to what I was going for: first I made them too long, then I tried to reuse some wire and failed miserably, then I tried to make the piece abstract on the right side and ended up with a half-@$$ed looking thing. Finally, I had this in my hands: The trickiest part was getting it on a chain as a necklace. I tried putting a jump ring in between the two antennas to hang from a chain, though the whole necklace just wobbled over to one side and looked thoughtless. Then I tried to look the chain in and out of the hole in the heart - the whole thing turned upside down when trying to wear it. Finally, I did a loop thing in the middle of the heart and got this! Though I was fairly happy with what I had created, I still needed to get the customer's thumb(s) up. I e-mailed Rob telling him that this is very preliminarily and that I can try other methods. He wrote the following: "I must admit that I had no idea how this was going to look when you told me your plan because I don't know much about jewelry. Let me simply say that I absolutely LOVE what you've done so far! It is so amazing. There's definitely no need to scrap the plans because it is exactly what I am looking for. I could keep going on and on about it." Whew! Mikey likes it! Rob also said that last time he gave his girlfriend a gift from Bead Up she immediately knew what it was based on the packaging, and therefore asked if I could wrap it differently this time. I sent him this little number: Rob wrote: "At the moment, she knows I am going to visit her in March for Spring Break but she has absolutely no idea that I'm going to fly out Valentine's Day weekend and surprise her :) Of course, I will be bringing this gift with me, so it just makes it that much more awesome that you're able to do this for her! I just know she's going to love it." I can't wait to hear how it went - I will of course post an update with Rob's story of Hannah's reaction as soon as I hear back from him! How sweet! 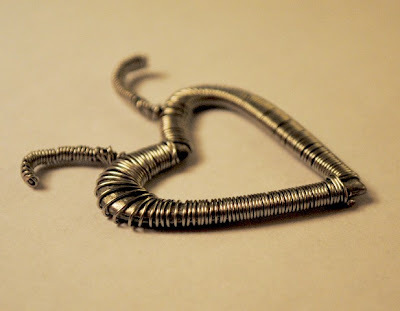 You did a great job on the wired heart! What a great story. You really are creative, my friend. I'm glad the word is getting out about your genius! That is a really cute story! I love mushy couple rituals. Aww, how sweet!!! I love their expression of love, they sound like a fun couple! And you did an amazing job of pulling that all together, I really enjoyed reading this! Christyn, you are amazing! I love how you love what you do:) How awesome! I hope when the time comes for these two love birds to tie the knot, that you have something to do with the popping of the question, hehe! Just delightful. I love reading about your custom work!